Augusta - Rory McIlroy was the man to beat coming into the 83rd Masters, but the Northern Ireland star said too many mistakes marred his opening round on Thursday at Augusta National. 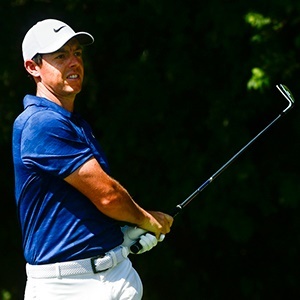 "I felt the course was there," McIlroy said of the rain-softened layout that should have suited his long-hitting style. "It's soft. There's not much wind. I made five birdies. That wasn't the problem." The problem was six bogeys in a one-over par 73, an opening score that dents his chances of a breakthrough Masters win that would make him just the sixth player to complete a career Grand Slam by winning all four of golf's professional majors. McIlroy was seven shots behind first-round leaders Bryson DeChambeau and Brooks Koepka after 18 holes. He has come up short in four prior attempts to achieve the feat at Augusta, but with seven top-10 finishes in seven starts this year - including a win at the Players Championship - he appeared primed to strike. McIlroy opened with a bogey after missing the fairway at the first. He missed birdie putts on the second and fifth, and missed a par putt on six as he made the turn at even par. He offset back-to-back bogeys at 10 and 11 with birdies at the par-5 13th and par-5 15th - where he produced a superb second shot through the trees. He got to one-under with a birdie at the par-three 16th before closing with another brace of bogeys. "I just made too many mistakes," McIlroy said. "and I'm making mistakes from pretty simple positions, just off the side of the green, 17 and 18 being prime examples of that." McIlroy said he was heading straight to the putting green to "try to figure this out". "(It's) just sort of reads more than anything else, he said. I over-read a few early on, and then I started to under-read them coming in." Some of that, he said, was because the greens were rolling slower after pre-tournament rain. "They will get faster as the week goes on, so it's just a matter of adjusting." McIlroy said one big number on the card would have been somehow easier to take than half a dozen bogeys. "That's a little too many," he said. "I just need to tidy that up a bit."